Kate Di Prima - Dietitian: The Noosa Triathlon - active, healthy families!!! What a weekend - finished the work I was behind with and headed to Noosa with the family to enjoy one of the most popular sporting events held here in Queensland - The NOOSA TRIATHLON. When my husband said he wanted to compete a few years ago I thought he was mad and had hit that 'late 30's mid life lycra crisis!!' However 4 years on he is happy , fit and healthy so I am not complaining. Master 9 year old entered for the second year running and also had a ball. For a mum and wife on the sidelines seeing your loved ones compete with such enthusiasm simply melts your heart! It was a joy to see so many children inhaling their watermelon after the race and downing pure fresh water. I spoke with some of the little ones racing - and the free water / water bottle and fruit was a highlight - simple pleasures. 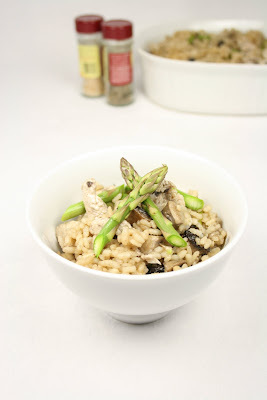 That night we sat down to a delicious chicken risotto to re stock Master 9's fuel reserves and load up hubby for his race the next day. Both boys achieved a personal best!! Heat oil and fry chicken and mushrooms until lightly golden. Remove from the pan and set aside Add onion and fry for 2-3 minutes. Add the rice and cook for 2 minutes stirring continuously. Add the wine and continue stirring till absorbed.